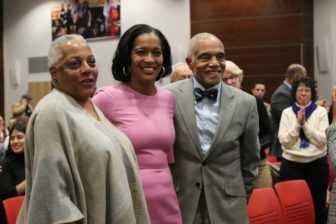 About 150 supporters of the Sheff school desegregation case gathered over the weekend to celebrate the 30th anniversary of the landmark suit, but also to ask a question that echoes the theme of Martin Luther King’s last publication: Where do we go from here? With a California-based law firm having filed a lawsuit last year that could seriously undermine Sheff, the Saturday event served as a kind of pep rally marking the strides toward integration made under Sheff, while simultaneously cautioning that those gains could be lost. Dennis Parker, executive director of the National Center for Law and Economic Justice and a longtime member of the Sheff legal team, told the group that much has been achieved by Sheff with the establishment of more than 40 magnet schools and a “choice” program that allows Hartford students to attend schools in other districts. The Pacific Legal Foundation, which has argued against Affirmative Action in cases across the country, filed a lawsuit last year on behalf of eight Hartford families alleging that the state’s lottery, which is used to fill the magnet schools, is discriminatory and therefore violates federal law because it is designed to limit enrollment of black and Hispanic students to 75 percent to ensure some integration. The parents who have joined the lawsuit as plaintiffs are frustrated that seats in some high-performing magnets are going empty when not enough white students enroll. Sheff proponents have asked the federal court to dismiss the case and are awaiting a decision. Elizabeth Horton Sheff and her son Milo Sheff, lead plaintiffs in the Sheff case, were in attendance Saturday along with other named plaintiffs. Newly-elected Congresswoman Jahana Hayes also spoke at the event about the importance of education in her own life and about the courageousness of integration efforts. 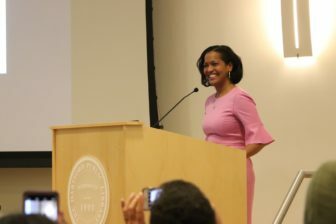 U.S. Rep. Jahana Hayes, a former national Teacher of the Year, spoke about the importance of education. She said she will “forever be grateful” for the opportunities she had. Hayes, who was selected as the National Teacher of the Year in 2016, said she has a Norman Rockwell painting on the wall of her office in Washington that shows a young Ruby Bridges being escorted to school by federal marshals. She spoke about the bravery of a mother allowing her child to be on the frontlines of integration. While much progress has been made in the 52 years since Rockwell painted Ruby, Hayes said the painting also reminds her that the work is not done. Several students who have benefited by the establishment of Sheff magnets also spoke up during the event. Javon Griffin, who grew up mainly in Hartford and now lives in Windsor, said that he attended a predominantly black school in Hartford. “Everybody around me looked like me and it felt comfortable but I didn’t know what it was like to meet somebody who was white,” Javon said. Sabrina Porter, a junior from Granby who also attends the the Academy of Aerospace and Engineering, said she had also been attending a school where the students all looked like her.